Nuts are very nutritious, and they may even help limit your risk of cancer, heart disease and other health problems, according to a review article published in Nutrients in 2010. You may worry about their high calorie and fat content, however, thinking that they'll cause weight gain. While eating large amounts of any food has the potential to cause weight gain, research appears to show that nuts may be more likely to help with weight loss than they are to make you gain. The number of calories you eat versus the amount you need to maintain weight determines whether you'll gain or lose pounds. Each 3,500 calories you eat in excess of what you need translates to one pound gained. On average, a 1.5-ounce serving of nuts -- the intake level that's linked to a lower risk of heart disease, according to the USDA -- has approximately 240 calories. An ounce of almonds, which is about 23 nuts, has about 160 calories. Cashews and pistachios have about the same number of calories per ounce, but if you opt for pecans or macadamia nuts instead, you'll be getting about 200 calories from each ounce. If you're worried about potential weight gain, stick to the lower calorie nuts and watch your serving sizes. Despite concerns that the high fat and calorie content of nuts might lead to weight gain, this doesn't appear to be the case. Many studies show that people who eat nuts regularly tend to have lower body mass indexes than people who don't eat nuts, even though they consume more calories overall, notes a review article published in the British Journal of Nutrition in 2006. Women who ate nuts more than two times per week had a lower risk of gaining weight or becoming obese than those who never ate nuts, reports a study published in The American Journal of Clinical Nutrition in 2009. Regularly including a 344-calorie serving of almonds in your diet isn't likely to lead to weight gain; most people tend to compensate for the calories they contain -- eating less during the rest of the day, which results in fewer calories eaten overall -- and not all of the calories seem to be absorbed, notes a study published in the American Journal of Clinical Nutrition in 2007. People tend to compensate for up to 75 percent of the calories in the nuts they eat because they are so filling, and regularly eating nuts may help increase metabolism, which means that moderate nut consumption during a weight-loss diet isn't likely to lead to weight gain, according to a review article published in The Journal of Nutrition in 2007. Not all research agrees, however, as a review article published in the Asia Pacific Journal of Clinical Nutrition in 2007 notes that adding nuts to a diet without accounting for calories could lead to weight gain, even though including nuts in a reduced-calorie diet is sometimes found to help with weight loss. Use nuts as a substitute for less healthy foods in a weight loss diet. For example, eating almonds instead of a carbohydrate-based snack with the same amount of calories and protein led to increased weight loss reports a study published in the International Journal of Obesity in 2003. Pistachios may have a similar effect: Those who ate pistachios instead of a pretzel snack containing about the same amount of calories lost more weight and experienced greater decreases in triglyceride levels, according to another study published in the Journal of the American College of Nutrition in 2010. Opt for plain nuts, rather than those coated in salt, candy coating, sugar or chocolate. Salt adds sodium, which most American already get too much of, and the other sugary toppings add calories without providing any essential nutrients. Have a small handful of nuts for a snack, sprinkle them into your oatmeal or yogurt for added crunch and flavor, or add them to a nutritious stir-fry made with vegetables along with chicken or shrimp. 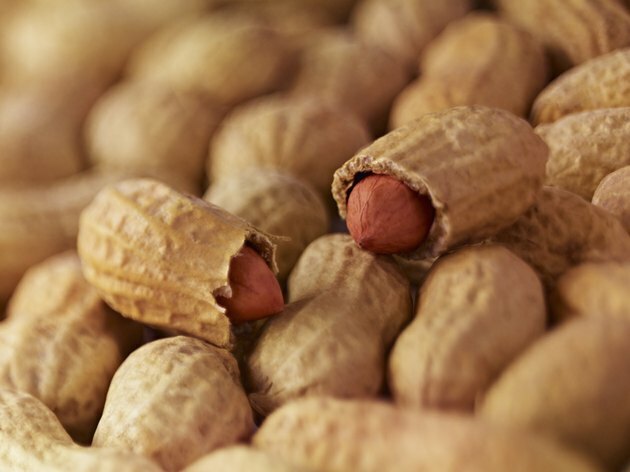 AARP: Nuts Are Good for Us. So Why Aren’t We Eating More of Them?